When it struck 12:01 am on January 1, 2018, many people were celebrating the start of a new year, a fresh start, a clean slate. Me? I had already been asleep for going on four hours. The craving for—and dreading of—a different kind of year had been on my mind since August 1, 2017. That’s the day my dad died. More frequent were the days he came home tired from laying brick in the hot sun on his knees. I see the exhaustion of parenting and working and living as a middle-ager now. But at the time, I only saw his irritable demands for us to remove ourselves from the spot he chose to sit and change the channel on the television to what he wanted to watch, even though I had just gotten comfortable on the couch and there were two empty lounge chairs open (and the fact that there were only 5 minutes left of the show I had been watching for 50 minutes). He was an old school dad. But the loss of Dad wasn’t the first of 2017. There were five major events of loss—2 deaths, 1 estrangement, 1 imprisonment, 1 destroyed marriage, 1 sold childhood home, 13 rooms of memories packed up and sold. All within my original family of 6. I had been adding up the numbers throughout the year. You do the math: it was a bad year. And Dad’s death on August 1st felt like salt rubbed in an already open wound. Except I received a gift I can’t help but get overly sentimental about, and it’s still not enough sentiment. When it hits the fan, when difficulty and tragedy and loss comes, the stuff we’re made of starts spilling out. Imagine a well-loved pillow that is barely held together after decades of existence and use. Then a toddler finds it and that pillow suddenly takes on some unintentional roughness. The old threads holding the seams together begin to fray and break, the matted cotton stuffing reveals itself through the opened seams, hanging loose at first, and then attaching itself to everyone who sits with that pillow. Humans are like pillows. If we are stuffed with anger, it can’t help but come out at the seams in the midst of difficult times. Similarly, when we are stuffed with grace and love and joy, those things ooze out of us too. Whatever is inside of us can’t help but come out when we face loss after loss after loss. And that’s how I got to know my sister. For real. Seven years younger than me, we grew separated by just enough time that our lives were always in different stages. Our marriages began in different decades and our babies were born in different cities. But now we are thrown together in the most heartbreaking of situations. She watched Dad die. 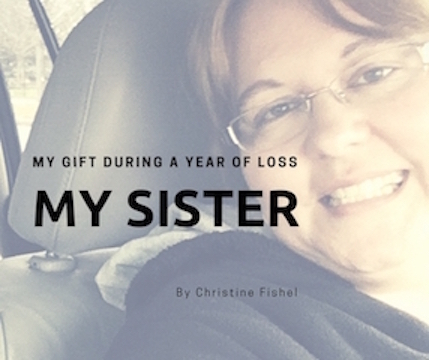 She was with Mom when they both experienced that tragedy. She held Grandma’s hand while speaking comforting words at her deathbed. She stood up for me in the midst of emotional attack. When it hit the fan, the stuffing that came out of my sister was grace. Understanding. Love. And because we all grew up in the same family, I know the hard work she must have done throughout her life to nurture the seeds God planted deep within her, to grow those amazing qualities to such fullness that they now can’t help but slip out of her seams when rough times come. How do I describe the gratitude and love I have for her? I can’t. I can only hope she knows, that my quirky, sometimes awkward actions reveal it day after day, like when I text her a silly emoji to represent the inside jokes we have now, or the obscure phrases that set off our laughing until tears fall. Those times are a gift I don’t deserve and therefore am holding onto as if my life depends upon it. I guess we can survive without someone besides Jesus who knows us and loves us anyway. But that’s not a life I’d want to live. And so I am praising God every day as I drive to work or pop the casserole into the oven or open my junk mail. I am thanking Him for my sister and all that He has done within her that gave her the strength to become who she is. She is the gift I opened in 2017 and am taking with me into this new year. This is beautifully written, I love it. May we all strive to be full of grace and love! Thank you Amanda! We all need to share our stories and edify each other. On the hard days, knowing we are not alone is so important!